The band members originally played in a Thrash/Cover band called Killer Instinct, but when Killer Instinct disbanded, they formed their own band called Crucifer. They formed in 1990 in the garages of Stafford County Va. Crucifer started as a 3 piece death metal outfit and has remained that way ever since. 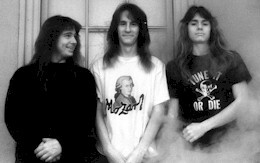 They quickly wrote and recorded their first 3 song demo "Beyond The Realms". It received excellent write ups with the underground press. Crucifer played some of their first shows opening up for some big name acts and were very well received. In 1991 they began writing their first full length cd. 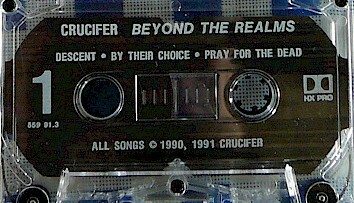 As the buzz got around about Crucifer they were approached by the underground label "Wild Rags Records". 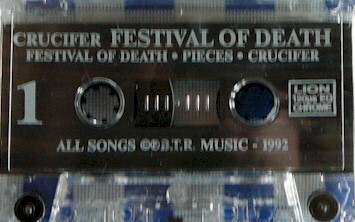 They signed a 3 CD deal and in 1992 released "Festival Of Death". Classic cover and pro tapes. Pro printed glossy cover and pro tapes. Xeroxed Covers, but did have a pro-printed tape. Lyrics included. Had a blue, green or white cover. Less than 500 of these were printed. Wild Rags eventually released it.